The McCracken Research Library at the Buffalo Bill Center of the West suggests the following bibliography for further reading on Annie Oakley. Havighurst, Walter. Annie Oakley of the Wild West. New York: The MacMillan Co., 1954. Reprinted by Bison Books with new introduction by Christine Bold, Lincoln, NE: University of Nebraska Press, 1992. Kasper, Shirl. Annie Oakley. Norman, OK: University of Oklahoma Press, 1992. Krensky, Stephen. Shooting for the Moon: The Amazing Life and Times of Annie Oakley. New York: Melanie Kroupa Books, 2001. Leader, Glenn Charles. “Annie Oakley in Performance: The Evolution of an Image.” Ph.D. dissertation, Florida State University School of Theatre, 1997. Macy, Sue. Bull’s-Eye: A Photobiography of Annie Oakley. Washington, D.C.: National Geographic Society, 2001. Riley, Glenda. 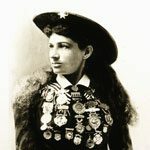 The Life and Legacy of Annie Oakley. The Oklahoma Western Biographies series, Volume 7. Norman, OK: University of Oklahoma Press, 1994. Sayers, Isabelle S. Annie Oakley and Buffalo Bill’s Wild West. Dover Publication, Inc., 1981. Swartout, Annie Fern. Missie: An historical Biography of Annie Oakley. Blanchester, Ohio: The Brown Publishing Co., 1947. Second ed. published as Annie Oakley: Her Life and Times, edited by Ronald Swartout, NY: A Hearthstone Book, Carlton Press, 1970. Complied by the McCracken Research Library. Updated August 2016.